RuckenDoc is a free Windows 8 app that lets you learn to alleviate back pain at Windows 8. This app for Windows 8 comes up with a complete guide to help people seeking for lower back pain and neck pain removal guidance. This Windows 8 app comes up with easy exercises that you can carry out in gradual increment. There are seven different exercises program starting from the Beginner Program, to the Cervical Spine Program, to Pilates practice, to Speed Program, to Lumbar Column, just everything. 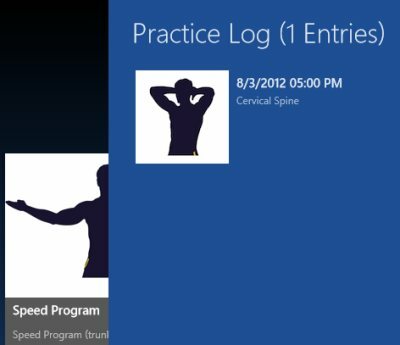 As you open the Windows 8 app to learn alleviate back pain at Windows 8, you will be displayed with all the seven programs in different tiles along with a separate tile to view all the exercises on a single screen. In addition, you will also find “Basics” category where you can get a basic knowledge about Anatomy, Trunk Muscles, and Disc Herniation. To view exercises or the video clip of each exercise, just click on one of the given programs. This will take you to a page where you can learn different exercises by read the text given below each body position or watch videos of each exercise one-by-one. In addition, you can also create a “Practice Log” for yourself where you can add when to perform a certain exercise and at what time. To create a “Practice Log”, just right-click anywhere on the main screen?click on “Save”, enter the date and time along with the exercise you want to perform, finally click on “save” button. Now, just check out your “Practice Log”, you will find all the added exercises there. In short, RuckenDoc is a nice app for Windows 8 to learn to alleviate back pain at Windows 8 desktop. Go ahead and download Windows 8 RuckenDoc available under the “Health & Fitness” category in Windows 8 Store, thereby helping yourself to alleviate back pain at Windows 8.